Jilote is spanish for baby corn, still on the stalk. It is derived from the Náhautl language. Xilonen is a sort of sub-goddess, protecting young corn and illustrating the importance of corn is all its cycles to the Náhau people (indigenous Méxicans/Aztecs). While in México, I traveled and participated in activities of the Unified Totonac-Náhuatl Indigenous group (La UNITONA). They are working to preserve thousands of years of knowledge of corn, culture, and their carefully cultivated native strains. Subsidized corn, corporate agriculture, and genetically modified corn threaten their livelihoods, food supply, and autonomy. Subsidized corn from the United States is one reason that farmers have left their homes in search of work in the major cities and the United States. They simply cannot compete. 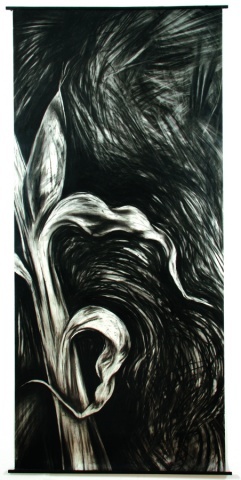 20% of the sale of this work will go to groups working to preserve native races of máiz/corn.